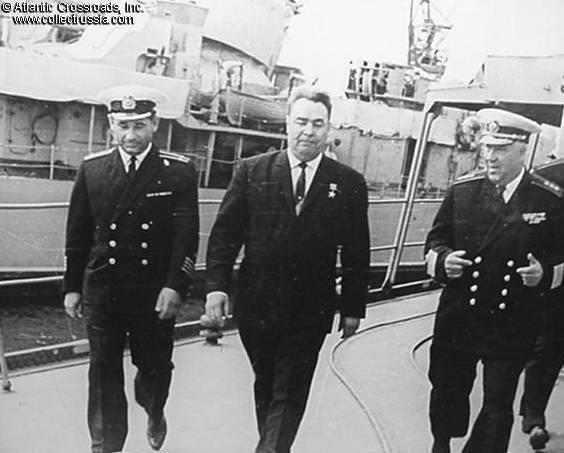 Photo album on Brezhnev's visit on Cruiser Kirov, Kronshtadt, 1965. The note on the last page states that the occasion was being awarded with the Medal for 20th Anniversary of Victory over Germany. The images measure 7" x 9 1/8", mounted on approx. 8 ¾"x 11 ¼" album pages. 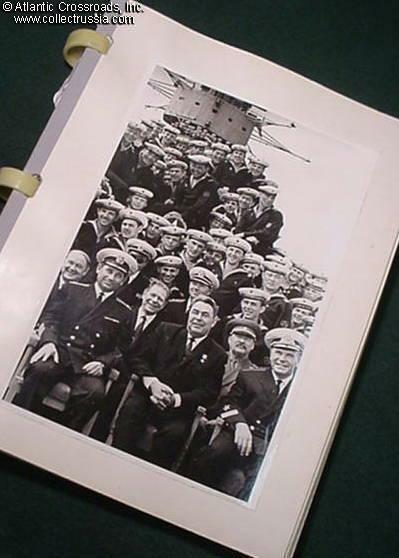 There are 13 photos altogether: nine of them show Brezhnev surrounded by sailors, one shows the welcoming committee on a navy pier, and three show various Kronshtadt landmarks incl. Naval Cathedral and the monument to Peter the Great, the founder of Kronshtadt and the creator of the Russian Navy. 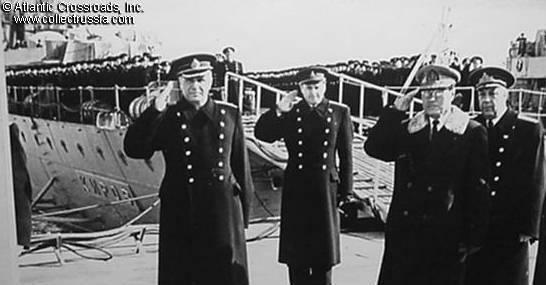 Three of the group photos also show Defense Minister Marshal Malinovsky. All photos are of course original prints from the negatives. There is no cover (we don't know if this album ever had one); the pages are held together by three plastic rollers. Rare glimpse of Brezhnev in his younger years, just before he unseated Kruschev as Communist Party General Secretary, and before he decorated himself with garlands of decorations. Battlecruiser Kirov was completed in 1938 and saw action in both the war in Finland, and WW2. It served well into the postwar years as a training and headquarters ship.